...Well, technically, episodes 3 and 4, as 5 doesn't air till tomorrow here in the UK. 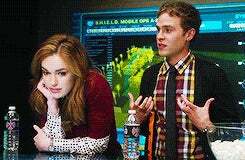 Spoilers and Fitz!Simmons adoration below the cut! Are they still doing the 'is Skye on their side or not' thing? I can't say I was particularly fond of the moment where she 'turned' on them in The Asset. It felt a bit fake (I guess that's the point), but it felt like a weird contrivance, especially as in the next episode everything's fine and dandy and all 'ra-ra SHIELD' without mention of anything at all - maybe this is dealt with in Episode 5, I don't know (so don't say!). It's an interesting plot thread, but I hope it's not dragged out over the whole season, she needs to pick her side soon. Agent Ward Bored is a little better, but god, he's still so bland. And grumpy. I guess they're going to go down the whole Skye/Grant will-they-won't-they path to try and soften him up, but that is also a bit lame. He can still be the team grunt/badass (although no one will top Agent May for team fabulous badass), just loosen him up a little! Although I will say that the 'Seduce' moment was fun. More of that for Agent Ward. What time does AoS air in the US? I'm not a super-squeamish person (okay I am a bit), but I was surprised at the severed hand-gore bit at the opening of Eye-Spy - I guess you don't see it happen and it was minimal screen time so not that bad, but still a weird surprise since the series has been quite 'vanilla' so far. Also, despite it's gore free nature, I squirmed like a little girl during the eye operation bit... I really hate messing with eyes, and it was borderline for me. Ugh, I love them. 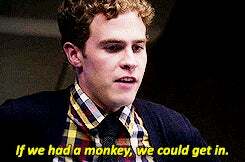 I am a shameless lover of Fitz and Simmons. I can't help it, they're both cute and funny and techy and Britishy and it's so damn delightful. Which means, at some point, one of them, or both, are going to be suddenly and tragically killed. DON'T LAY ONE OF YOUR MURDEROUS FINGERS ON THEM, WHEDON. So yeah, I know it's not the greatest televisual treat to grace our screens, but I can't help but really enjoy Agents of SHIELD so far. Onwards and upwards, Team Coulson!